Neogen's newest consumer friendly Ramik® Mouser RF is a great option for the homeowner looking for rodent control solutions. 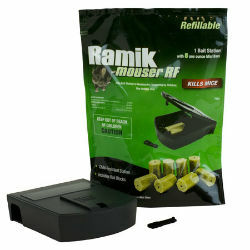 The Mouser RF package includes a refillable bait station and Ramik® Mini Bars. This refillable bait station is easy to use and child resistant. The Ramik® mini bars are a proven and effective anticouglant rodenticide and will be kept securely inside the bait station. The bait station's two small openings allow easy access for mice to enter and feed, but prohibit access to children.